On the 3rd (Sun), tour the pleasant surroundings at Alfred Park, then tour the pleasant surroundings at Chandrashekhar Azad Park, then take in the spiritual surroundings of Sai Dham Mandir, and finally don't miss a visit to Triveni Sangam Allahabad. To find maps, traveler tips, other places to visit, and more tourist information, use the Allahabad online visit planner . Dubai, United Arab Emirates to Allahabad is an approximately 11-hour flight. The time zone changes from Gulf Standard Time (GST) to India Standard Time (IST), which is usually a 1 hour difference. Traveling from Dubai in February, plan for a bit cooler nights in Allahabad, with lows around 14°C. 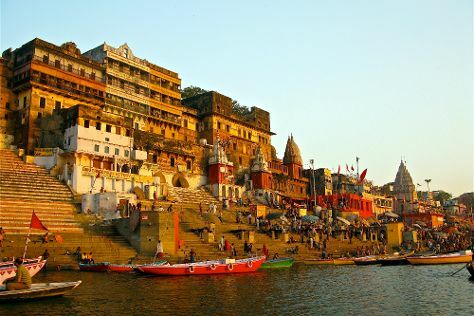 Finish your sightseeing early on the 3rd (Sun) so you can travel to Varanasi. On the 4th (Mon), take in the local highlights with Walking tours, explore the activities along Ganges River, then make a trip to Dasaswamedh Ghat, and finally steep yourself in history at Rajendraprasad Ghat. On the 5th (Tue), you'll have a packed day of sightseeing: relax and rejuvenate at some of the top local wellness centers, admire the landmark architecture of Golden Temple (Kashi Vishwanath), and then don't miss a visit to Sarnath. To see traveler tips, other places to visit, ratings, and tourist information, go to the Varanasi day trip planning site . Traveling by car from Allahabad to Varanasi takes 3 hours. Expect a daytime high around 31°C in February, and nighttime lows around 15°C. Cap off your sightseeing on the 5th (Tue) early enough to travel to Bengaluru. 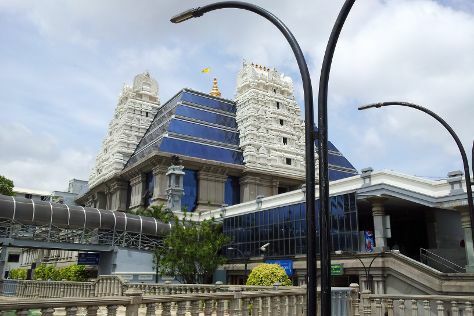 Kick off your visit on the 6th (Wed): contemplate in the serene atmosphere at ISKCON Temple Bangalore, stroll through Cubbon Park, then admire the landmark architecture of Vidhana Soudha and Attara Kacheri, and finally admire the natural beauty at Lalbagh Botanical Garden. To see other places to visit, reviews, more things to do, and tourist information, use the Bengaluru trip planning tool . Traveling by flight from Varanasi to Bengaluru takes 3.5 hours. Alternatively, you can drive; or take a train. Expect a bit warmer temperatures when traveling from Varanasi in February; daily highs in Bengaluru reach 36°C and lows reach 20°C. Cap off your sightseeing on the 6th (Wed) early enough to travel back home.